Tomorrow Ariel and Eric are getting married! 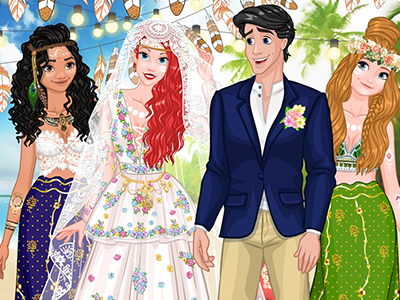 Princess Ariel is very much fond of festival fashion, so when it came to choosing a wedding theme, there was no other option but Coachella! Help Ariel and her pretty bridesmaids, Anna and Moana, put together the most beautiful Coachella-inspired wedding looks.